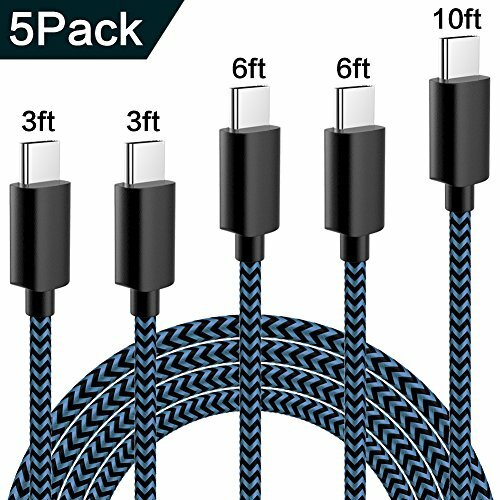 USB Type C Cable,WUXIAN 5Pack (3/3/6/6/10 ft) Nylon Braided with USB Long Cable for Samsung Galaxy S9,Note 8,S8 Plus,LG V30 V20 G6 G5,Google Pixel,Nexus 6P 5X(Black&Blue) by WUXIAN at All Company Mobiles. Hurry! Limited time offer. Offer valid only while supplies last. ♦High Quality Nylon Braided Lightning Cable: The WUXIAN connector heads have good resistance to heat and corrosion, you'll see no signs of use.